Guess what? Today is October 31st. That means it is the last day for the 31 for 21 Blog Challenge... Raising Awareness, One Blog at a Time! I hope you've enjoyed my every day blog posts for the past month, even though sometimes they are not very exciting ;). Yesterday my sister Qadoshyah, did a post on her blog of 21 things about Osiyyah that make him unique and that she is thankful for. I have to agree with it! I am so thankful that God gave us Osiyyah. He is such a special little man. He has grown and changed since he was little, but one thing has stayed the same - he makes us laugh at something every day, so many times a day! Even though this "challenge" will be over, I'll still post on my blog :). . . just maybe not every single day! Right now I am figuring out due dates for does and who REALLY needs to be bred, so I'm going to go. Have a good day. 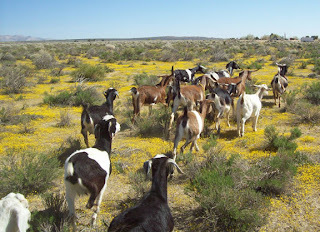 We had goats in California, just a few less than we have now. . . right now we have about 45, in CA we had 25-30. We did not have much property, but we lived in the middle of nowhere so we would let our goats out and watch them browse for a few hours. Nobody cared and we saved some on feed. The only time of year when there was a fair amount of "growth" was in the Spring time. Most Springs there were tons of wildflowers and and a small amount of grass and sage. For the rest of the year, there was just dry sage and bushes. The picture below was taken in the Spring. Oh, and no trees really! We brought about 25 goats from CA with us here to Oklahoma. First of all, we got a LOT more property and it was all goat fenced. The difference was/is amazing. There is good pasture for probably 9 months out of the year, and we can let the goats run on it all day long. The picture below was taken shortly after we moved to OK in the summer of 2008. Our routine now is to. . . milk our does, get all them off the stand, bring our "boarding" goats in and put them on the milk stand, put the kids in their yard (or at night, their stall), milk these goats, take them out, and then feed everybody. In the morning it takes about 1 to 1 1/2 hours. At night it takes about 45 minutes. . . partly because we are faster (not half asleep :)), and partly because we don't feed everyone hay at night (just some of the goats, like the bucks and kids that don't go out to pasture). Last night Mom took a few pictures of us milking the Young's goats. . .
while their here, I've gotta take care of their feet. . . just because I like to :). Here's an interesting fact for you. . . we've had at least 1 doe (but more like at least 4-5) in milk since January 25th, 2007. . . that's 3 years and 9 months, and I don't have any plans to be without a doe in milk anytime soon! I enjoy milking and living on a real (goat) ranch. . . In the summer months when 20 something does are in milk and it's 100+ degrees out, it can get a bit tiring, but I wouldn't want to change anything. Or, when we kid out lots of does in the winter/spring and have to be up every 4- 6 hours to bottle feed kids. Or when there is a sick animal that has to be tended to every few hours. Or when it's below 0 outside and we have to get out there in the sleet and snow, and take care of animals. . . I really don't mind it and am super thankful for the way we live! Oh, incase you didn't notice - I made a new banner for my blog (at the top), and also made a little logo thing incase you would like to link to me (see it on the right side underneath the "about me"), feel free to copy and paste it. Hope you have a good day, on your ranch. . . or elsewhere ;). Well, I am going to be "goat sitting" for the next week or so. We are milking 16 of our does, and then 5 of our friends' does that are here. More milk, which is good!! I went out and got a few photos of the "front yard crew". It's 6 of the "boarding" goats, Cutie & Blondie, 2 sheep and the alpaca. Have a good day! Today is the 26th, there are only 5 days left in October! And only about a month till Thanksgiving... yikes! This year has gone by SOO fast. It's a nice day today. My brother just sold 5 pigs and in a little bit someone is suppose to come to buy 6 of the Boer goats. . . good deal. I don't have much to talk about, but since I don't mention much about the sheep we have. . . here's a few links with more info. I think we have 16 (?). Well, life on the ranch here is going pretty good. Last night we (or should I say, my brother Norayah!!) brought home 17 pigs. So, if I am counting correctly, that means we have 32 pigs right now... yikes. But, they come and go all the time. There will probably be less tomorrow :). If anyone is looking to buy some cute little Pot bellied pigs or regular pigs, give my mom or brother an email or call (918-598-4007). . . they might just have what you want. Even this late in the year, we are getting stuff from the gardens... very nice!! All the goats and sheep are doing well. This morning I was feeding Ace (Boer buck) his grain, and all the sheep, who normally are not very friendly, and the llama came up and were being kind of too friendly. But, it was alright ;). Remember, if you are needing a buck email me, I'll give you a deal!! I thought I'd post about some of the more helpful online and email groups for animals, especially goats. The one online one that is very helpful is Dairy Goat Info. Since I am under 18, I cannot post (just their rules), but I read a lot on there. Northeast Oklahoma Hay & Feed Coop - well, me and mom are the owners, but it's a good list still :)! 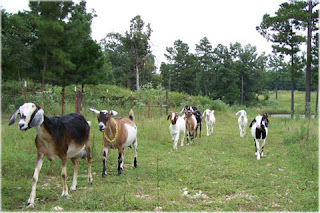 HolisticGoats - very helpful when you have a goat problem, whether you want to treat it naturally or not. NubianTalk - for all you Nubian goat folks! Mid-AtlanticMinis - a very friendly group of Mini dairy goat people in the mid-atlantic! So, not much else exciting going on today. Somehow I hurt my hip (not the first time) yesterday morning so I feel a bit lame, but I think it should get better ;). Today is the 21st, so that means I only have 10 more days to do a post everyday, then I can get a break :)!! Sorry everyone about my post last night. I was coming in from outside to do one, and then the storm hit and there was all kinds of lightening, pouring rain, etc. So, when a storm that bad comes, we normally unplug the internet so it doesn't go out. Anyway, this morning there was a break and right when we were done milking it started again! It makes doing the animal chores a bit harder, but it is a blessing as we needed some rain. I thought I'd so a post about my sister's and mom's book that they wrote. Soon after my brother was born, they thought they should write a book about all the things you can do to help a child with Down Syndrome live a normal life. When Osiyyah was born, we were given the "doom and gloom" info that he'd never be able to do this or not. He has lived way beyond their expectations! So anyway, this book is full of information from doctors, therapists, parents, siblings, and more to inform people about down syndrome. Plus, this book is HUGE and the price is so cheap! Down Syndrome: What You CAN Do! I thought I'd briefly talk about living with food allergies. When my little brother, Osiyyah, was a couple years old, we realized that he was allergic to cow milk/cow dairy. Until just about a year ago or so (I'm not super good with time-frames, so bare with me :)), we didn't realize that he was *VERY* allergic to cow dairy. He can have a tiny bite of rice with cow butter on it, or cheese, or sour cream, etc. (all made from cow's milk) and he will have bad reflux/choking. Thankfully, God has been very kind, and he has never had pneumonia from it. After we removed cow dairy from his diet, he would still have the reflux, just not as bad. My sister and Mom researched and we decided to remove gluten from his diet. Gluten is in wheat, rye and barley. It is hidden in SO many things you would not believe. Some very odd things like some Twizzler candies have gluten in them! After removing the gluten from Osiyyah's diet, he has been reflux-free ever since. If he accidentally gets a little "cow" or "wheat" (according to him), he will have an allergic reaction - reflux, and it can be super bad. So, after finding all that out, we learned that there is a genetic thing most of the time, especially with the gluten allergy. So slowly, a lot of my family went off gluten. The changes have been amazing in some. My 18 year old brother has had stomach issues, tiredness and aching legs for a lot of his life. Once going off of gluten, his symptoms have gone away. He is really, really sensitive to it. He can eat something with a tiny amount of wheat in it, and within a few hours he's on the couch with his legs hurting saying, "what did you feed me?!?" It's really amazing and he's not the only one. There are 3 different "stages", I guess, with the gluten thing. You can just have a gluten intolerance, a gluten allergy or you can have Celiac disease where when you eat anything with gluten, it eats away part of your intestine - no good! Most people will say that is is "hard" to live gluten free. Convenience-food wise, yes, it could be. But, as a family of 13, it has not been hard at all hardly! We are used to making a lot of food from "scratch". Really the only thing that we removed from our diet was breads/pastas, as that was the main thing we would eat that had gluten in it. The goats have been a huge blessing, especially with Osiyyah's high allergy to cow dairy, as we can make goat butter, goat cheese, goat everything! Anyway, I hope you found that interesting!
. . . I worked on buddy walk stuff for a lot of the day, just doing odds and ends for it. I finished 1 poster, and made a notebook full of info (that took the longest). This morning some friends came over to help butcher the hog with my brother, so while they were all cutting and packing meat, I was working on this stuff (I'm not the butcherer anyway. . .). We had these miniature hay bales, got them from an auction probably. I think they are cute, and am probably going to use them for decoration. So, me and some friends wondered if we could make them. We tried, and decided that they must be made with a machine - they are packed SO tight. So instead, we made our own mini hay-bale type of things - they're still cute (the one in the pic is not a good one! ), just not as cute as the others :). After doing things like that all day. . . except I did have a "break" and loaded 28 hay bales. . . we decided to learn a new line dance which I got down fairly well (my sister "Q" being the teacher), and then we danced the ones we already knew and got our workout ;). Very fun! So, there's my post for today. Have a great evening! We only have 6 days... almost 5 days... till our Buddy Walk. My sister Qadoshyah is running a booth for Reece's Rainbow adoption ministry, and we are having the small animal petting zoo. SO, we have not prepped for it that much and I keep telling my whole family -"the buddy walk is in 2 weeks". . ."the buddy walk is in a week!". . ."the buddy walk is in 6 days, we have to get ready!!" :). So today, I started to make posters and things for our booth. I think everything should come together pretty well, but we do have to do some things otherwise we will end up running out of time. Tomorrow, Mom said, we are going to work on the Buddy Walk things. Tonight I finished a sign, and am working on information sheets on the animals. I have to work on getting all the pens together and everything organized. Tomorrow it's going to be a bit busy in here I think - my brother, Norayah, slaughtered a hog he's been raising to put in our freezer (for us to... cook) and in the morning some friends are coming over to help with the processing. And then we'll be doing the Buddy Walk stuff. . . hopefully. Well, I hope I wasn't too boring with this post for you today! I just went through the iPhoto library and picked a few pictures out that were taken today. None of the goats in the picture below are pregnant :). . . healthy goats! these piglets are SO cute!! They are wild and run all over.